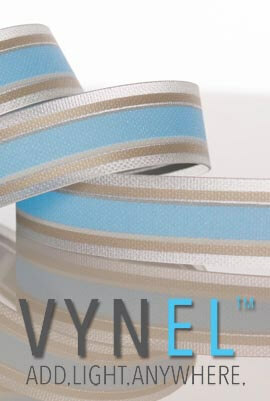 The VynEL™ HD A5 Size Panel is our heavy duty (HD) line of panels. It's flexible in nature, about 2x the brightness over common EL Panels, and able to integrate into numerous applications. The VynEL™ HD A5 Size Panel is our heavy duty (HD) line of panels. It's flexible in nature, about 2x the brightness over common EL Panels, and able to integrate into numerous applications. The HD line of panels uses our proprietary TPU which has a textured top layer, which boasts a unique feel, and gives a splendid finish for those looking for top quality materials. The VynEL™ HD line can be heat bonded directly to fabrics, using many different heat bonding materials, perfect for wearables, Hollywood, and more. 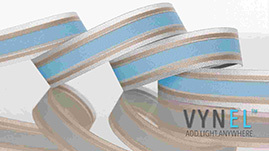 The VynEL™ HD (Heavy Duty) product line is wonderfully versatile product meant for numerous applications. It has a super cool textured finish (which we love) and meant to be used in heavier duty applications, like outerwear, sporting goods, or outdoor products. Our new VynEL™ Flow is a lighter weight product with a bit of a stretch, more suitable for activewear or performance fabrics. Please Note: VynEL™ requires an inverter to operate. For best performance, we recommend the MEGA100+ EL Inverter.